We don’t have strict rules revolving around candy and Halloween. It’s (mostly) just one day of the year, after all. At the same time, we try to keep most of our autumn treats healthy. Every year, for example, we make homemade applesauce in the slow cooker. It’s a treat as much as all the candy is. Most recipes I’ve come across throughout the years call for a hefty dose of sugar. We don’t substitute anything special in its place. Instead, we leave the sugar out. You know what? It still ends up tasting absolutely amazing with all its natural goodness. This recipe is a great one to make with small children. I suggest chopping the apples ahead of time and letting little hands put them into the pot. Then stir on the spice, start the cooker, and let the delicious aroma fill your kitchen. Fresh apples. Total number depends on size. Enough to fill up crock pot. I never peel the skins off my apples. Simply wash and chop into wedges. 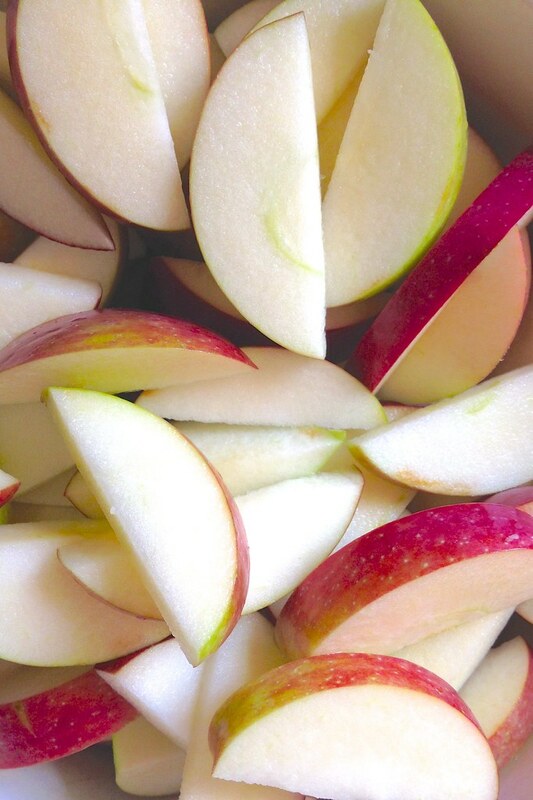 Fill up your crock pot with the apples. Then add a tablespoon or two of cinnamon. Pour in a tablespoon or two of lemon juice, too. Cook for two to three hours on high, stirring occasionally. Then mash with a potato masher. Alternatively, you can wait for the applesauce to cool and process until smooth in your food processor. Eat up within three to five days. Or store in glass jars in the freezer. If you haven’t used glass to freeze before, check out this post with instructions and more information. 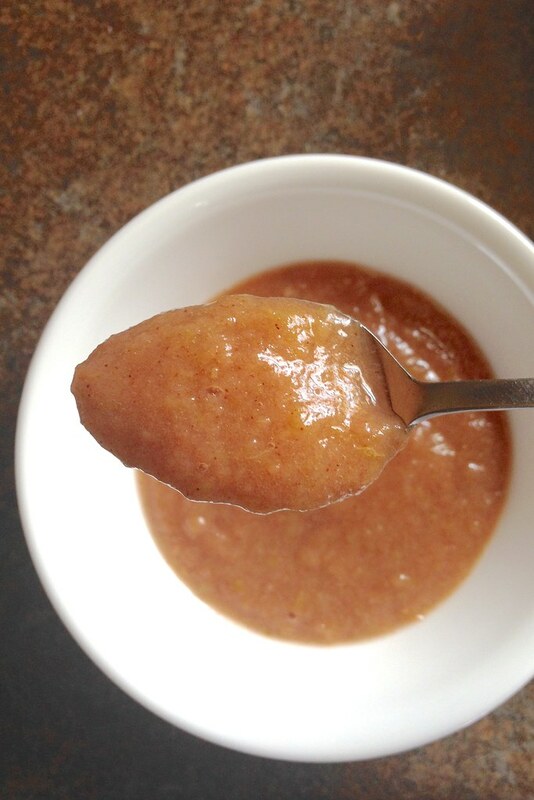 To give your homemade applesauce a festive Halloween twist, you can even add a bit of canned pumpkin to the mix. The pumpkin gives it an orange color, thicker texture, and naturally sweet flavor. Plus, it’s a great way to sneak in some additional nutrition. It’s also a great side dish to bring to a party or fall potluck meal. If you’re shopping around for a new toothpaste (for kids or adults) to help guard against all the sugar intake this season, here’s what Aquafresh® has to offer. You can visit their website, Facebook, or Twitter for more information. Aquafresh® toothpaste with Sugar Acid Protection from fluoride delivers the taste/fresh feeling and protects teeth from sugar acids caused by eating everyday foods. Aquafresh® Extreme Clean Whitening Action includes gentle whiteners for a brighter smile. Aquafresh® Cavity Protection toothpaste with helps protect your teeth from cavities. Aquafresh® toothpaste protects tooth enamel from damage caused by sugar acids. 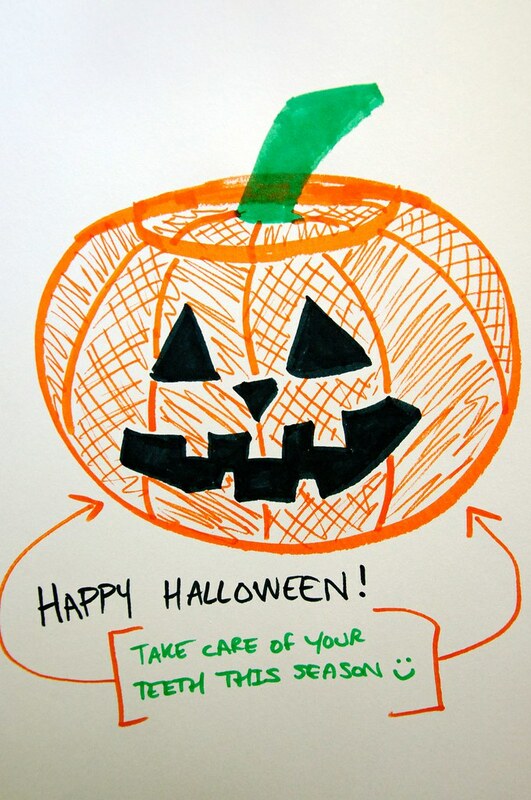 I hope you all enjoy a happy and safe Halloween this year. In all your fun, don’t forget to take care of your teeth! You don’t exactly want your smile to look like your Jack-o-lantern’s, right? How are YOU going to protect your teeth this Halloween? Tell me in the comments and you will be entered to win a $100 Visa gift card!